Poster designed by Bruce Conforti for the 150th observance of the California Gold Rush. 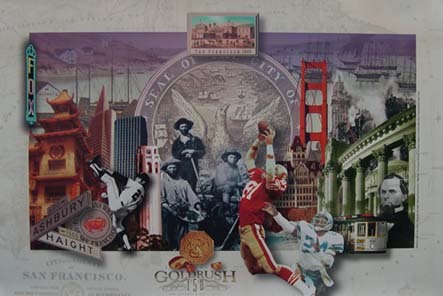 This 24-1/2 inches by 36 inches poster features San Francisco’s official city seal, gold miners, cityscapes, world-renowned landmarks, eclectic buildings, and beloved sports stars. John White Geary, the city’s last American alcalde, first postmaster, and first mayor, inaugurated May 1, 1850, is the lone figure in the right-hand corner.